I really did like this book, but at the same time it annoyed me. First, I have always been annoyed that fantasy and science fiction are lumped together as if they were one genre. Oh, I am aware of the history that brought that about and, in fact, this book has an essay by Orson Scott Card in which some of that history is discussed, but it still remains that fantasy is to science fiction as astrology is to astronomy. The difference is profound and yet fantasy and science fiction is most often shelved together and treated just like they are the same thing. I find it hard to see that any two genres of fiction could be further apart though. So I was even more annoyed when the Science Fiction Writers of America became the Science Fiction and Fantasy Writers of America. That is as if the American Chemical Society started admitting alchemists. 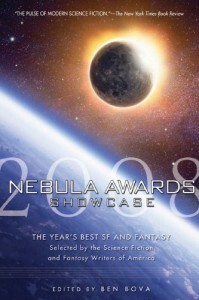 So, of course, it is going to annoy me that the members of the SFFWA produce an anthology of both science fiction and fantasy as if there was no difference. I do prefer science fiction over fantasy, but I will admit that I do like fantasy too. It's just that they are entirely different things. You may as well publish an anthology of romance and techno thriller stories. As far as I know that may have been done, but I am not aware of it and I certainly would not expect it. Nevertheless, these are very good stories. As someone who prefers science fiction I am glad that science fiction is predominent, but both the science fiction and the fantasy are very good and they were selected by professional science fiction and fantasy writers, so at least such writers should and do know what is good. I just wish that the fantasy writers would get together and select the very best fantasy stories for a similar anthology and that the science fiction writers would get together to select science fiction stories for a similar anthology.